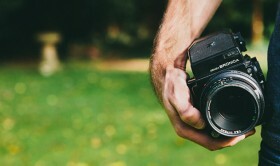 Good or bad photography or misguided use of images can make or break a website’s effectiveness. Stock imagery websites can provide really professional looking photography but companies run the risk of using clichéd imagery or worse, images that have no relevance to the services or product. If you plan to use stock photography, you must choose the images that align with your brand, message and values. If you don’t have those fleshed out as a company, take some time to think out your brand strategy, since that will dictate what imagery you use. Whenever possible it’s usually a good idea to get a professional to shoot photos for you, especially if you are a product or community based company. Although it’s ok to post mobile phone shots on Facebook, generally your website should be a more professional reflection of your business. We recently designed a new website for Posh Cupcakery using a very clean and sophisticated look. We wanted to showcase their product like precious jewels, since their cupcakes are extravagant and unique. We used sample photos in her mock-ups and the new design impressed everyone. The glitch came when Posh sent us their actual photos, which we intended to use in place of the samples. No amount of Photoshop touch-up would improve the images, and since Posh’s website depended on great photography, they decided to let us shoot their product using on white photography with minor props. The results showcase the artistry of each cupcake and display well online. If only we could communicate how great they smell and taste! We also created graphics from the photos for the home page and page banners using the beauty of the cupcakes as the main design element of her website.